There is one day in May that serves as a symbolic holiday when we can show our appreciation to the woman we call “Mom.” A mother will sacrifice everything for her child/children. She will love unconditionally and will always be there for her children. A mother is someone we can share everything happening in our lives with. We instinctively know that in times of happiness or sadness or when we just need someone to talk to we can always talk to mom. Mothers aren’t just there during the special times in our life, they are there for the little “everyday things.” Mothers don’t just nurture our bodies, they nurture our spirits. Mothers come in all shapes and sizes and colors, and they come with all different personalities, so we shouldn’t judge all mothers by the standards written above. Every mother is individual and each relationship is as different and unique as the people in them. Some mothers may have sacrificed more than others due to their unique life circumstances. Mothers are only capable of doing the best they can according to what is available to them. 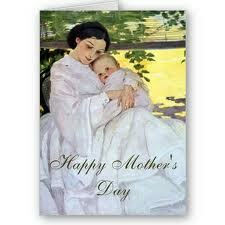 Being a mother is about nurturing, protecting, loving and doing the best they can do to raise their children. Every parent’s idea of parenting is different. The times and places we live in also plays a huge role in our parenting skills, as does one’s education and how we as mothers were parented. Motherhood should be measured by how loved and cared for we felt as children and how we are respected and loved as adults. That love and care a mother provided throughout all the stages of our life is why we have one day a year to express our heartfelt “thanks.” So, don’t forget to at the very least pick up a card or the phone on that day in May when we have the opportunity to say “Thank You” to our mothers. If your mother has passed away then light a safe candle in your home or at your place of worship to wish her a Happy Mother’s Day in heaven. If you have any ideas for unique and/or meaningful surprises for Mother’s Day don’t be shy! I’d also love to hear about something special that was done for YOU for Mother’s Day. Please share! 🙂 Just click on “Comment” above! Such a resourceful blog for parents and what gorgeous designs for mother and baby!! !